"Have you ever seen a woodblock print?" asked printmaker David Bull, with a twinkle in his eye. Up until that point, I thought had seen a fair few. He then turned off the light overhead and steered me toward the sunlight streaming through the window, putting one of his latest prints in my hands. Sure enough, what had seemed a lovely design under the harsh fluorescent lighting took on a new depth in the soft glow of the winter sunshine. The colors were richer, the fuzziness and subtle grain of the handmade paper was readily apparent and the impression left by the wood-blocks used to print the design could be seen to full advantage. "What you are seeing now is 20 people's work; you are seeing the guy who made the paper, you are seeing the guy who made the baren, the guy who made the pigments, the printer, the carver ... It's a three-dimensional object. To me, it's a beautiful thing." Born in Britain and later a resident of Canada, Bull started his career as a dento-hanga shokunin (traditional Japanese printmaker) relatively late in life - aged 35 or thereabouts. He was both a musician and computer engineer at the time he happened to see some ukiyo-e in a Toronto gallery. He was hooked. Despite a 'can-do' attitude that had served him well in his earlier occupations, Bull's first attempts to reproduce the magic he had seen in the gallery left him rather frustrated. The obvious next step was to move to Japan with his family in tow and study the process in depth. Bull went at it with his ears back, meeting other printmakers, block carvers and papermakers and examining original works. Although getting some useful tips from some old masters, Bull taught himself the ins and outs of the dying art. "The traditional woodblock printmaking thing is dead," says Bull. "Printmaking these days doesn't work in terms of 'schools.' Most of the other arts work in terms of 'the sensei' and all that, but printmaking doesn't work that way. It's totally free. Otherwise, I would have run away screaming 10 years ago. After a time of trial and error and a lot of English teaching to pay the bills, Bull felt ready to take on a rather ambitious project, one that would make or break him as a hanga shokunin - the recreation of the Hyakunin Isshu, a series of 100 prints of famous Japanese poets. In the ten years that it took to complete the project Bull's techniques in all aspects of the art reached professional level and earned him the respect of the few remaining print craftsmen, as well as a substantial client base that enables him to work full-time as a dento-hanga shokunin. Bull now knows dento-hanga like few others. In fact, it's probably more accurate to say he knows the art like no one else in the entire world. In the glory days of ukiyo-e printmaking, from the mid Edo Period to the late Meiji Period (1720-1890), printmaking was a cooperative effort of a number of different craftsmen. Famous artists like Hiroshige, Utamaro, Toyokuni and Yoshitoshi would have made the designs but left the carving and printing to independent craftsmen. Bull is able to do everything himself but the design, and even that difficult task is tackled on occasion. Despite his expertise, Bull insists that he isn't an artist, just a technician." "Actually. I'm just having fun. I'm making a living. I like making woodblock prints." Surimono were privately commissioned hanga of a smaller size created strictly for poets, cognoscenti and other artists. Money was no object and only the best materials were used. It was this exclusive genre that Bull thought would be a fitting challenge for the next stage in his development as a hanga artist (oops!) technician. "What I'm doing now is taking this concept of privately published prints - not for monetary gain, not to make a million, just to try and make as beautiful an object as I can." His new series of surimono, for all their extraordinary beauty, are very reasonable at 6000 yen. But they are only available in a series of ten - one per month. When quizzed as to why he doesn't charge more for his work, Bull said, "I don't want to do 'bank lobby' stuff. I would rather make things that 'Mr. and Mrs. Suzuki' would buy. 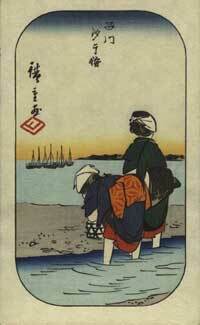 "Since Meiji times, Japanese people as a cultural group have forgotten what a woodblock print is. If there is a mission ... it is just to show people how beautiful these things are."